My company is looking to purchase Active Reports because we are interested in how easy it is to add a chart to a report. 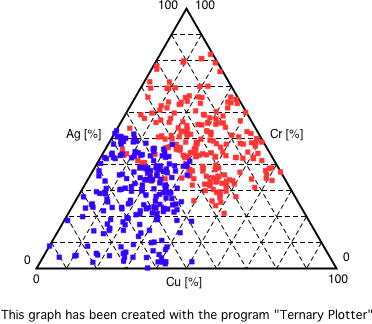 We are interested in doing ternary plots (2-d triangle) to show elemental compositions of steel inclusions. Here is an an example of a ternary plot like we would like to do. Is there anyway to do this with Data Dynamic's chart? I know that Chart FX offers a plug which can do this. Unfortunately, our chart control in ActiveReports for .NET does not currently have a ternary chart type. However, I've entered case 42688 to proivde this feature in the future. I'll also send you an email for the case, linking you as an assoicated customer. Fortunately, though you can use ChartFX on an ActiveReports. I recommend downloading evaluation versions of both ActiveRepors for .NET 3.0 and ChartFX to try it out. You can find a walkthrough at the following link. You can download the latest releases of ActiveReports for .NET at http://www.datadynamics.com/forums/72/ShowForum.aspx. I'm currently evaluating multiple charting controls and this is an evaluation point. Is there any progress on the support of the ternary chart on WPF ? ?